DMCTECH’s tube mill line is designed to produce ERW steel tubes and pipes in shapes of round and square with high strength and high performance. The tubes can be utilized as general structural tubes, machinery structural tubes, automotive tubes, water and gas pipes, heat exchange pipes and API pipes (line pipes and OCTG). Slitted coil skelps are inserted into the line, pass through forming and sizing lengthwise, welded by high frequency welder and cut to required lengths. 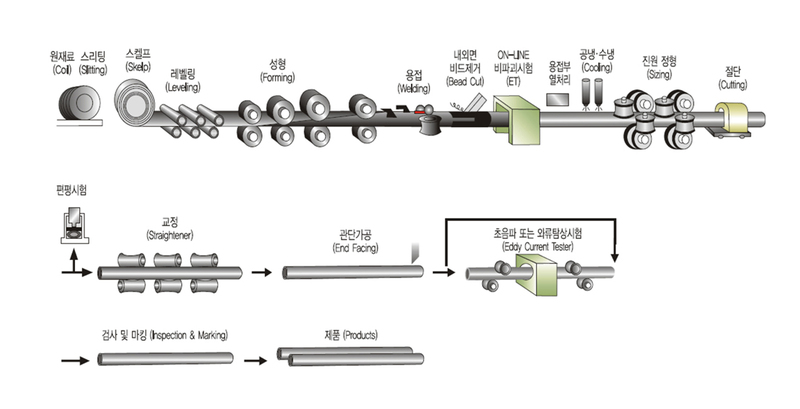 The tube mill line consists of 4 major sections (entry, mill, cut-off and finishing) and the line equipment composition can be modified according to kinds of tube and pipe, working condition and the process the customer needs.